This is a really tasty chicken recipe. We are always looking for something different and this one is a great one to try out. In a small bowl, stir together the sun-dried tomatoes and water. Let stand for 10 minutes. Drain. Return the tomatoes to the bowl. Sprinkle 1/2 teaspoon oregano over the chicken. Stir the olives, parsley, 1/2 teaspoon oregano, and red pepper flakes into the tomatoes. Gently stir in the feta. Three miles on the schedule today. I say schedule but I don't really have anything on the schedule except maintaining my base. I've got to sit down again and go through a plan to keep me on some type of schedule. Today's plan was to go a little speedier than normal. I'm testing some new shoes that are not even available yet. Full review coming tomorrow! This week looks excellent here for running. It's so nice not to have three layers on. Well I've now done 13 half marathons since I started running in 2010 and I thought it would be interesting to see how I've performed in these. My current fitness level - frankly, I've run most of the half marathons while training for a full marathon so I think that gives me an advantage. Sometimes the half just feels easier because of all the other mileage I'm doing already for the marathon. Weather - this really is a big factor. I've run in almost 70 degrees to start and I've run in 30 degrees. That should make for a huge difference in the results although I'm not sure it really does given the times below. Elevation - of course, the hillier courses are tougher courses, yet, surprisingly I've run some hilly courses better than the lesser elevations. Distance - while I've used 13.1 in all the distances, these have been slightly more or slightly less in actuality based on my Garmin. 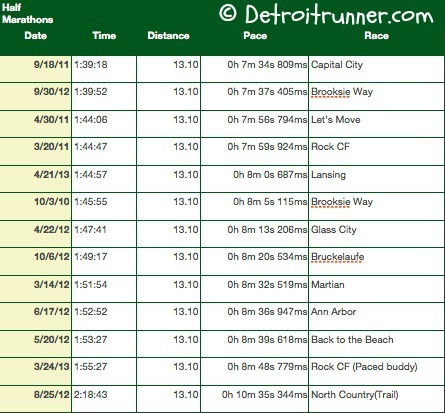 What' interesting is that Brooksie Way is probably my hardest half marathon in this entire bunch yet, I almost PR'd at this race in 2012. On top of that, I ran 10 miles the day before it. It seems I was really in my peak of marathon training for marathon #4. Same holds true of the Capital City half where I have a PR. I was also near the end of marathon training. My conclusion is that in order to improve my times on the half, I need to be in marathon training. Haha, yeah right! Of course, I could probably just train harder for the half marathons and NOT be in marathon training but the extra distance had apparently helped improve my race times. 5 miles on the schedule today. Ran the neighborhood this morning. Nice a warm in the mid 50's - finally I think spring is here. It's supposed to be in the 70's today and the 80's tomorrow! Of course to meet these famous runners was amazing and truly an honor. However, I've also met some fantastic people from the area including some fantastic race directors that have given us local runners opportunities to run in races. Without local people like these, we would not have races. They work tirelessly to put on great races for our area. I'm sure you too have met people like this in your part of the country as well. But most important of all I've met many people, both local and from around the country, that are just regular runners like myself. We enjoy getting out and meeting other runners so we can talk about running, learn about running and socialize about running. Haha! I've met these people through the blog or through their blogs, at races, through Facebook and Twitter. There are many others too but I need pictures of them! haha! It's nice to have a camera with you at all times. Of course, running is much more than just running. It's a community. 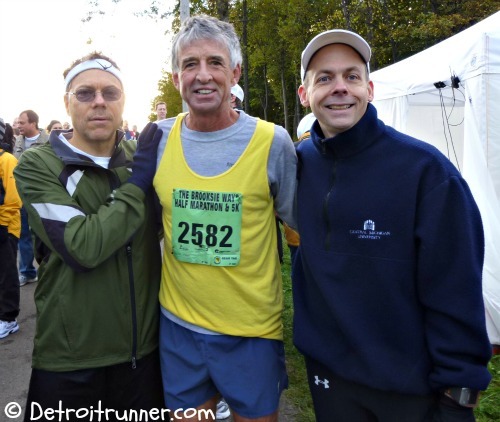 It's the people we interact with that makes the running community what it is and why I continue to run. Yes, I do it for myself but there's so much more to it than that. We went out on the trails this morning. A nice flat run on the Paint Creek trail. I love it out there and my plan is to be out there more than Stony now that the weather is starting to cooperate a little more. We started off at the Paint Creek Cider Mill for a change of scenery. The plan was to do a 10 mile run today with an out and back. 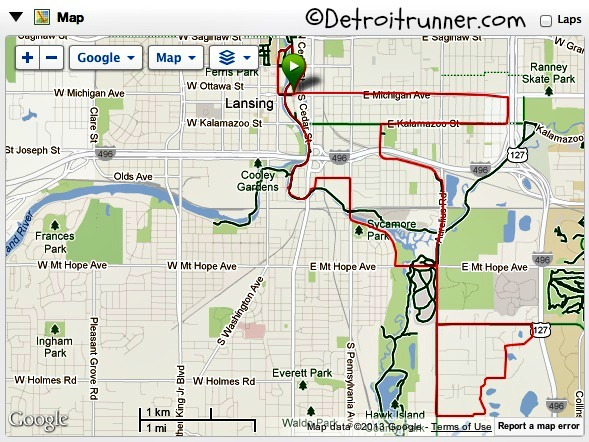 This would take us to the end of the trail in Lake Orion and back. The weather was outstanding! Things started off a little chillier than we thought(about 38 degrees) but excellent running weather. I brought a thin running jacket and probably didn't need to bring that since it came off after we got to Lake Orion. There nothing like running by some nice scenery and under a wooden bridge. Overall another successful run on the trails. Next weekend, the plan is for another 10 mile run out at the Pontiac Lake Recreation area. The Stay in the Shade organization is doing a 10 mile training run on the trails there with support at the start and finish and half way through as well. All for free! If you are interested, think about joining us out there. While I love doing road races, training on the trails help save my legs from the pounding of asphalt and cement from during the week. Plus if you run the right trails, it can help strengthen your legs from the uneven surfaces for road racing. So we had a great turnout for this giveaway! You people must really like socks - me too! Congrats Mary on the new socks. I'll e-mail you to get your contact information! For those that didn't win, try them. You'll like them! If you like fish like we do, then you likely eat it as least once or twice a week and are always looking for recipes. I like this recipe. It's a little bland but so low in calories, fat and sodium. Heat a large nonstick skillet over medium-high heat. Pour the oil into the skillet and swirl to coat the bottom. Cook the onion and celery for 2 to 3 minutes, or until soft. Place the fish on top of the vegetables, or roll each fillet, securing it with a toothpick, and place the rolls on the vegetables. Add the remaining ingredients except the parsley. Bring to a simmer over medium-high heat. Reduce the heat and simmer, covered, for about 8 minutes, or until the fish flakes easily when tested with a fork. To serve, carefully transfer fish to a platter. Remove the toothpicks. Sprinkle the parsley over the fish. We enjoy this with Broccoli and a salad. I usually eat more than one piece of fish. 5 miles on the schedule today. This has been the week of struggle. My 3 miler on Tuesday, I was still fairly sore. No soreness today, of course, but still not feeling it. I'll hopefully announce the winner of the Balega Socks tomorrow since when I went to pull the winner Rafflecopter was down. Stay tuned. Who says Detroit doesn't rock? 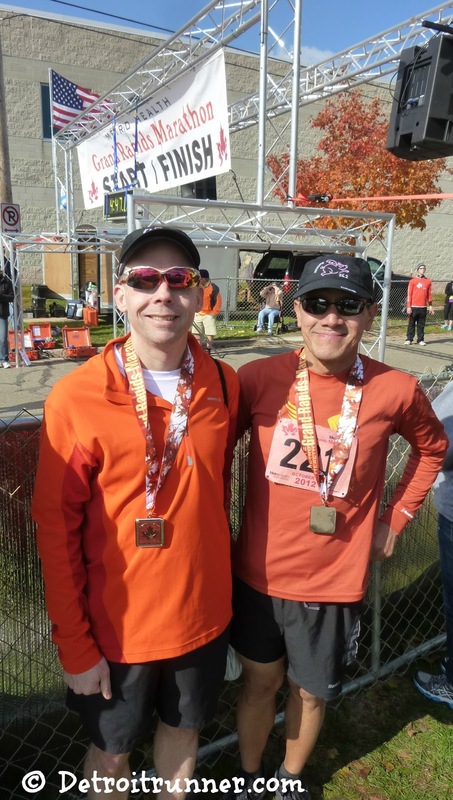 Great Lake Bay Marathon/Half Marathon Next Month!!!! As some of you already know, I'm a race ambassador for the Great Lakes Bay Marathon this year (Click HERE for their website). 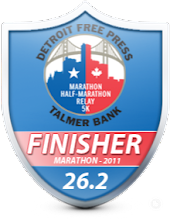 For those of you that don't know it, the Great Lakes Bay Marathon will be coming next month on May 19, 2013. That's less than a month away and I'd love to see you all join me for this event. 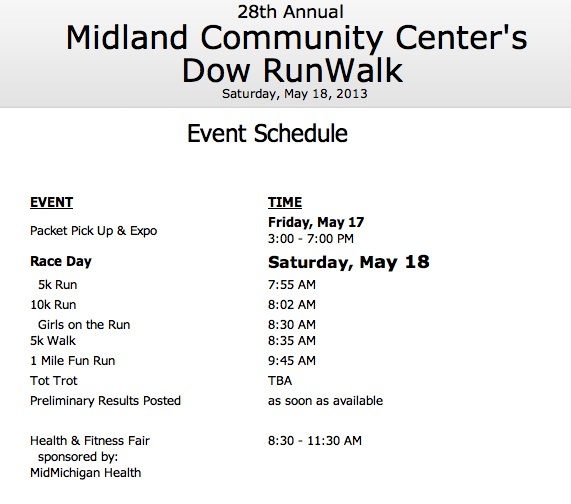 As you can see, the Dow RunWalk is an event geared towards all types of runners and walkers for the entire family to enjoy. It looks like an awesome event to be involved in and a great one especially for those that have not signed up for a 5k before. Here a great chance to try it. I hope you'll find you like race events as much as I do. 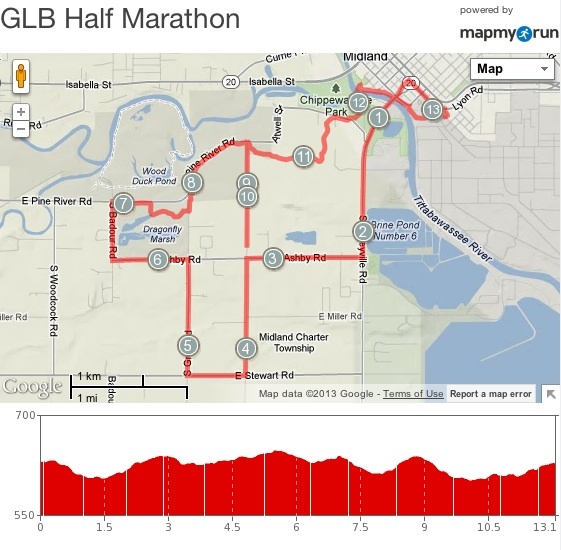 Then, on Sunday will be the area's Marathon and Half Marathon, the Great Lakes Bay Marathons. I'll be running the Half Marathon of the event but there's sure to be lots of people also running the full marathon. As I've said in a previous post, the half looks like a fantastic course. 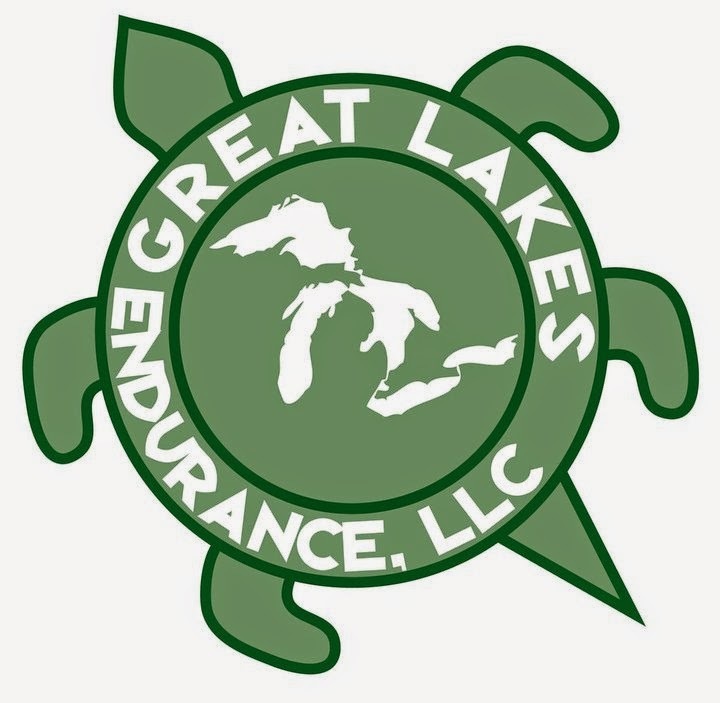 I love that it goes through parts of the trail system(as does the full) which makes sense since the race will help raise funds for the Great Lakes Bay Regional Trails. The best part I can see about the race is the finish line! It's inside Dow Diamond. I absolutely love stadium finishes - you feel like such a rock star! One of the best ways to finish a marathon or half marathon in my opinion and a rare opportunity. If you are looking for a PR, consider joining one of the pace groups. The race has Marathon Pacing set to come to the race to help pace you to a new PR. 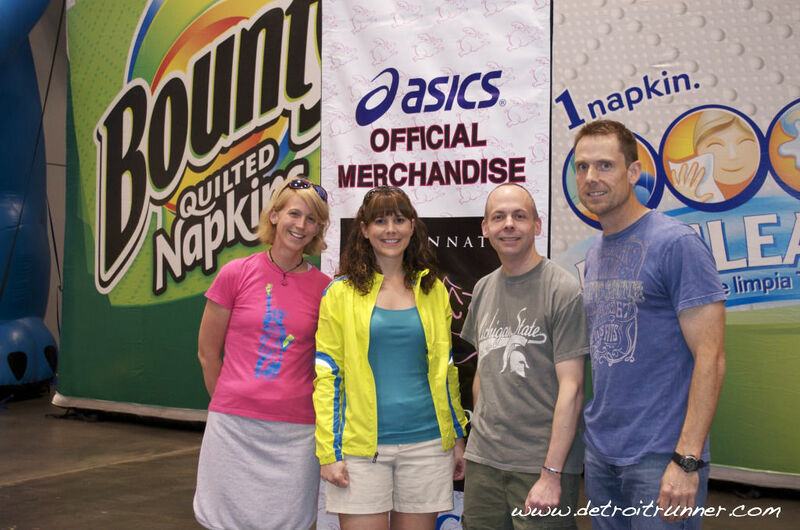 I've run with these guys at the Detroit Marathon and they helped me achieve a PR. These guys are good and have a tremendous amount of race experience to get your there on the time you want. I'm always a guys that gets there early so I can park close to the start/finish line but, as you can see, there is quite a few options to park and get to the race in a timely manner. So what will you get for signing up? 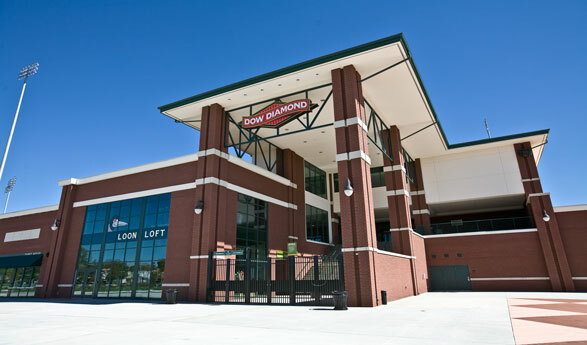 Each runner receives an event shirt, a goodie bag, a supported course with aid stations, post race food, the awesome finish inside Dow Diamond and a finishers medal if you run the half or full marathon. Of course, the race will be chip timed so you'll know how you did on it as well. So I hope you decide to sign up for one of these great races. If you are interested in joining me for the half marathon, I hope to see you out there. Let me know if you'll be joining me so we can meet up before the race. Only 26 days and the race will be here! If you've been training for a full, now's the time to get signed up and commit yourself to it. You've got eight days before the next price increase so click HERE to sign up. Also, new this year, the race is offering a $10 discount on the Brooksie Way Half Marathon if you sign up for the half or full Great Lakes Bay Marathon. The discount code is GLMBROOK2013 to be used during checkout. I've run the Brooksie Way twice before(click HERE to see last years review) and I've already signed up to run the Brooksie Way this year as well. It's another incredible race experience. You've got less than one month to sign up for this event. I, for one, can't wait to enjoy it! It will be half marathon #14 for me. If you can't join us, I'll have a detailed race review of the half marathon as I always do with races so you'll get a great idea of what the event was like. Here's hoping for cool temperatures and no rain! Overall, not a race I would run again. Awesome medal - one of my favorites but other than that, the race organization, communication, and course are something I'll leave for others to run until they make some changes. Registration was very simple. The race had a website for information. Everything was done online at Active(dot)com. You could also send in your race registration as well. I was registered in minutes. I registered on June 25, 2012. Almost 10 months early. Normally I don't tell people when I register but it allows you to understand some of my frustration. Of course, I just happen to see this twitter request from another runner above Friday evening and could not believe it and was quite upset. Frankly, if there is ever going to be a change like this the day before the race, the race director should send out an e-mail to all registered runners notifying them of any changes. I was told on Twitter to call the volunteer coordinator and "she was making a personal sacrifice to help you out" since of course, there would be no guarantee. Subsequently, I talked to the packet pickup volunteer(who was very nice and helpful by the way) and she confirmed that there would be race day pickup(not just for me obviously) but not until 7am and she guaranteed it would be open. There were issues with security due to the Boston bombings which is why it had to be for 7am. This I could certainly understand. Frankly, I would have rather been told this instead of someone on race management making it out to be that a volunteer was making a personal sacrifice(which they are anyway - the very definition of a volunteer) to get me - and just me - my packet. It was nothing more than an attempt to make me feel bad for not coming to the expo the day before. The Lansing police/State police presence at this event were overwhelming. I expected it would be high but didn't realize until throughout the day that I've never seen this many police at an event ever. 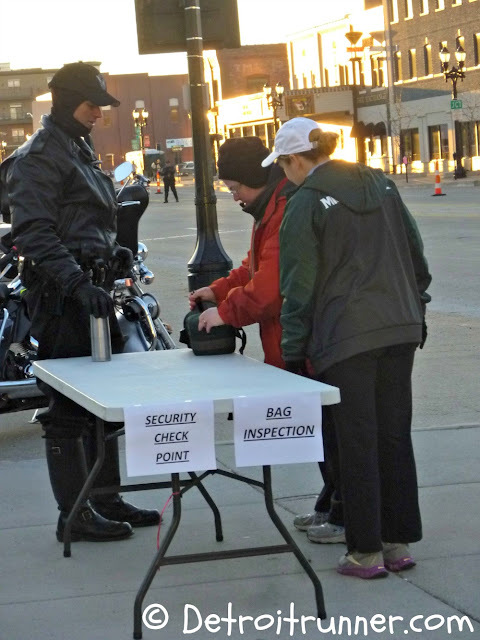 Of course, this was also one of the first marathons after Boston so I was happy to see the race management and police were taking things very serious to keep us safe. In fact, all over the place, people had on little ribbons that the race provided(but they ran out at the expo) and others had things like I did. It was a nice feeling to see everyone pull together. This area also had an area for volunteers to check in. According to the race management on Facebook, there were over 500 volunteers for this race. Now I have not managed a race before so I don't know every detail of this but that sounds like a tremendous amount of volunteers for a race with only over 2,000 runners. Of course, there were many more marshals on the course than I've ever seen due to security as well so perhaps that is why that many were needed. Regardless, all volunteers I met were very friendly, helpful and appreciative that runners were there to run the race. 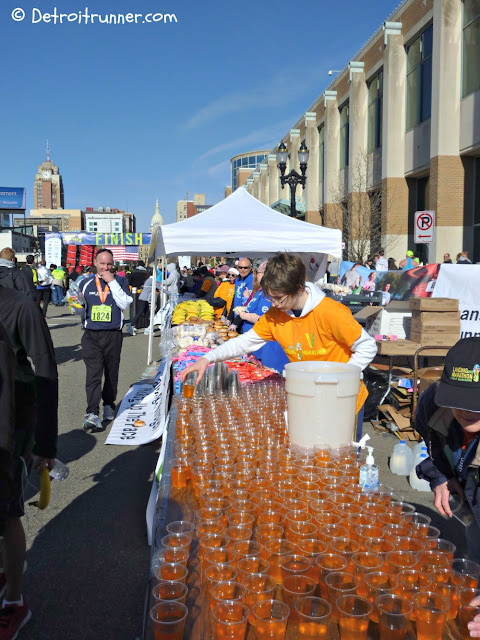 Of course, I appreciate all that the volunteers do for us runners on race day as well. At race packet pickup, there appeared to be plenty of volunteers for this task. As I picked up my packet, they said they were out of race shirts in Medium but they gave us something to fill out so they could mail them to us. I also tried to get my running buddy's packet and Small was also out. Wow! It appeared that there was a last minute demand for the race so they gave away all the shirts at the expo. This is the first race I've ever been to that ran out for pre-registered runners. Now to me there is no sense in getting angry at a volunteer like I've seen people do. I've volunteered for the race packet pickup job before and there's no fault of the volunteers for this issue so I just sign up for mailing and went on my way. The race said they will make things right and get them out to people that did not get one and I applaud them for that; however, my primary issue is that they should not have given out race shirts to the people signing up at the expo to begin with. If you recall, I signed up in June 2012 yet someone last minute can come in because they could make it to the expo and sign up? It's really disappointing that the race management could not manage this better. Last minute registrations should ALWAYS be told that they have to wait until AFTER the race to see if there are shirts left, otherwise, the race would need to order them shirts after. To me, it's the only fair way to do things. So unfortunately, I won't be able to show you the shirt until I actually receive it in the mail. I will say that I saw lots of people wearing the shirt on race day and I really like the color(blue) and the design and it will be one that I will wear once I receive it. Packet pickup - great volunteers! After I took my packets back to the car, I was able to get a few pictures of the start area. The start area was very well organized as you can see below. It was also right next to the Lansing Center so all the runners were able to wait inside until just before the race started. I really feel this is an excellent place to start the race. It was a nice touch to see the American Flag hanging from the start line as well. 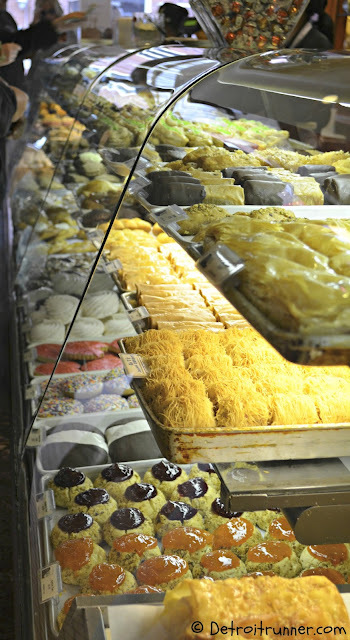 Another reason it's a great place to start here is this is the Capital of Michigan. As you can see below, the Capital building is right near the start except we actually run the opposite way of the building but it's still a very nice area to start a race. In addition, before the race, they did a tribute to a local runner who ran Boston this year but got stopped short. 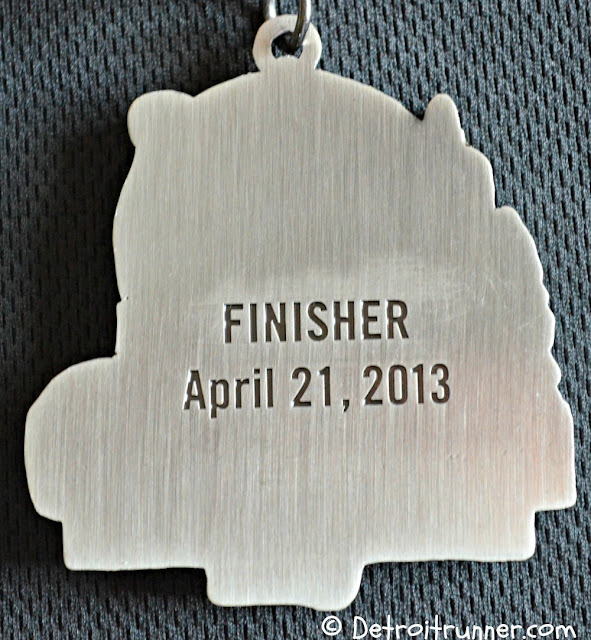 She was symbolically finishing her race and the Lansing Marathon was giving her a medal - very nice and a great idea! They did the National Anthem and we were ready to start racing!!!! 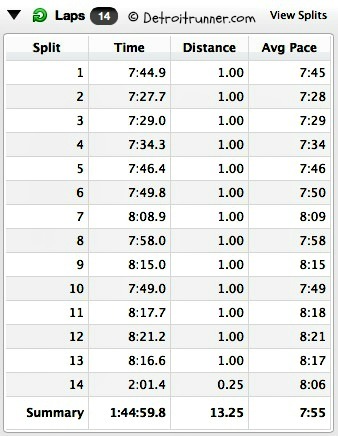 As you can see from my splits, I went out entirely too fast. I should have never been running in the 7:20's. My goal for today was 1:45:00 but I don't think I could have gotten any faster if I wanted it. I just wasn't feeling it today to get any faster. Overall, though, I'm happy with the result and felt a 1:45 is within my fitness at this point. Based on my results, I really should have gotten closer to these start line since I had to run around many runners and some walkers too. * Note: I take pictures during the race to enhance the review but I don't slow down or stop to cause any race issues. Not all are perfect but I'm getting better. A couple days before the race was to start, the management made a call to change the race route. We have gotten lots of rain here in Michigan and Lansing has a river that runs through it. The river was flooded in several parts so they had to change the course at the last minute to avoid most of the flooding. Unfortunately, it probably took out some of the best parts of the course since much of what was moved was away from the river and away from the trail along it. I don't give any fault to the race management for this. They did what they had to do to still have a race and I commend them for that. I will say, however, that there was only three miles at the very end of the race which I felt was anything worth coming back for. Perhaps the original course would have been better had it not been flooded but I didn't run this last year to know otherwise. The rest of the course was in neighborhoods(even an apartment building lot/street) and near freeways and was not very scenic. I don't know the roads of Lansing so I cannot say whether they could have made a better course but, given the circumstances, I think they did an excellent job at modifying it at such short notice. Unfortunately the weather did not cooperate the week of the race. I'm glad they had the foresight to plan ahead for this aspect so a race was still possible. It was pretty crowded to start but after about a 1/2-3/4 of a mile things started to thin out nicely. It would have been nice for the race to at least have pace signs up at the start so that people correctly got into their paces. This would have eliminated running around so many runners. I would not expect the race to have corrals with the smaller numbers there but signs could have helped. USA great start to the race! You can see already at the 1 mile market that it's not that crowded. This is one of the nice things about doing a smaller race. As you can see below, we are running by the side of the highway. Not a very scenic route in my opinion. You can see there is more of a spectator crowd at this point of the race. For a small race, I was actually very pleased with the support from the people including the residents. 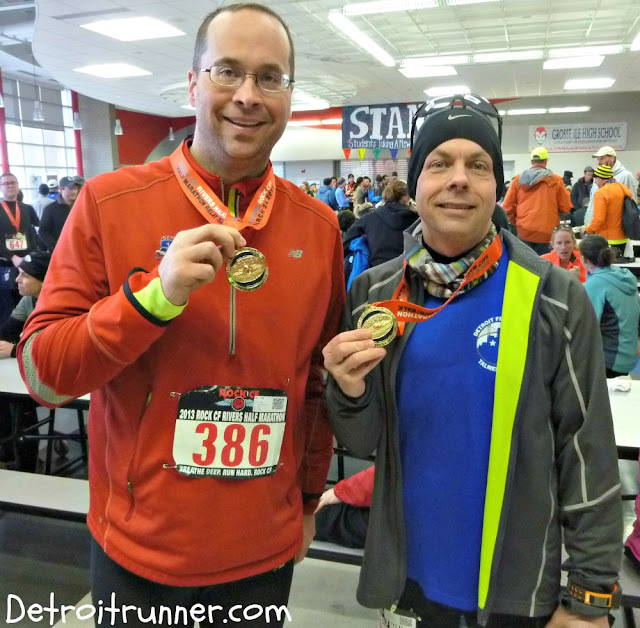 It was more than many races, even larger races, that I've run in the past. I'm sure many came out not only to cheer their runners but to support runners given the events at Boston this week. I took a picture of this sign which is funny because there was not much to see. Perhaps summer looks nicer. In the apartment building area? Huh, interesting. A neighbor who made a great sign and was giving out water - very nice people in Lansing. I think it was right around here that I saw Spike from Running Spike and Red from Caution, Redhead Running, both H/W and bloggers and was cheering on the runners. Spike was dressed as a bear? haha! It was nice to hear her scream out "Detroit Runner". I also saw Colleen from Running One Mile, 13.1 as well several times at the race. She was doing the relay. One thing to note is that they had the signs up for every mile marker so you got to see what the marathoners would be looking at on their second loop. Personally, I would not run a double loop marathon but I know they are popular in the Ironman series for Triathlons. I never felt so good at mile 22 - oh did I mention it was a double loop for marathoners? The yellow container was a great idea. These are at the end of the aid stations so runners could throw their cups into it and try to keep down the amount volunteers had to pick up. I thought it was smart. As you can see here, we had to get detoured onto the sidewalk because the street was completely flooded from the rains. You can see further to the right how much water is there not only on the street but next to the street. A train above(which apparently stopped some runners on the course. No mention from race management this might be a possibility. The picture below is the start of the trail. It was the best part of the entire route starting at almost mile 11. Wooden bridges - love this part! We didn't get to go over the steel bridge below and still remained straight but I can imagine this is a fantastic place for a run. This was also a great place for spectators to yell and/or get pictures of their runner. It was also a great place for runners to run. This art below is right by the river and the trail. A nice touch. We did get to cross a steel bridge to get over the river. If you look closely, you can see the capital building right in the middle. Another nice part of the race. Almost at the finish line right near the start. I do like loop courses so you are always seeing something new. Unfortunately, there just was not much to see except the last 3 miles of the race course. 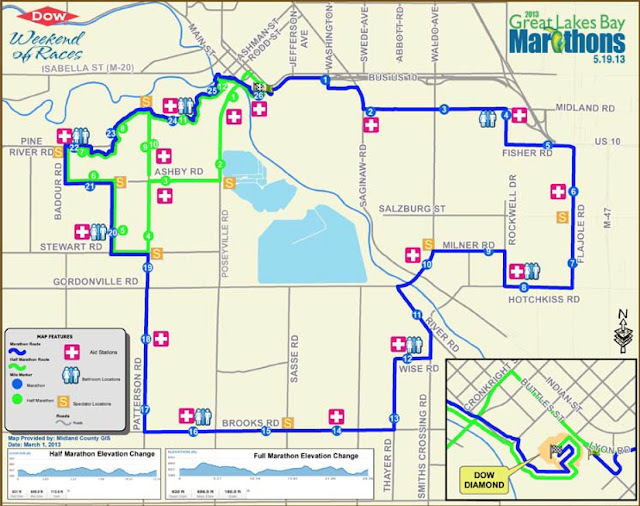 Of course, that is just my personal opinion and some of you might really like a double loop marathon in the neighborhoods. I would have liked to run right past the Capital building also or maybe onto Michigan State. 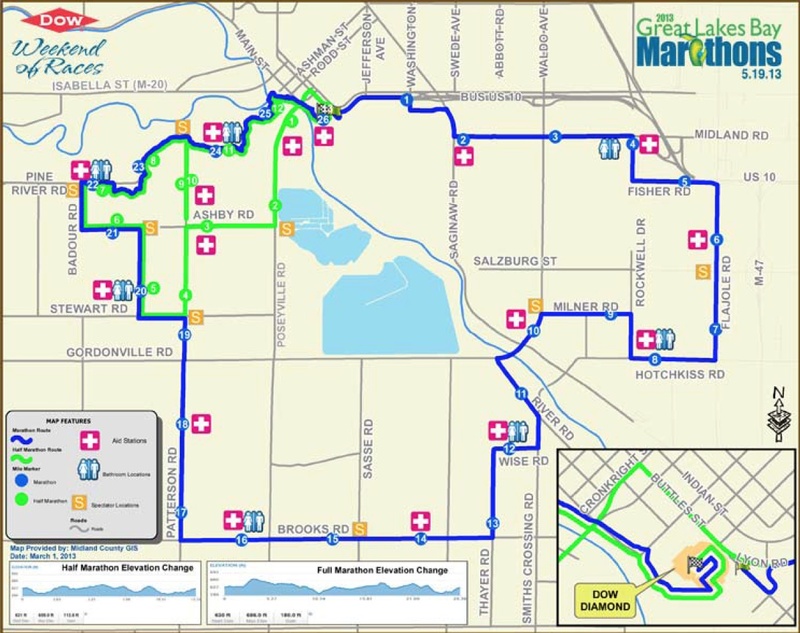 It seems the double loop is more to make it easier on the race management than about having a great course for the runners. I was very happy to not run that second loop. The aid stations were well stocked and had plenty of volunteers at them. They offered water and some off brand type of gatorade for fuel. While I'm not one to use GU for a half marathon, if you wanted it, you would have had to bring your own. If you were running the marathon, you would need to come prepared. I've never seen a marathon that didn't offer GU or some kind of gel on the course. In fact, many half marathon courses I've run even offer it. In addition, the course should offer something that is not off brand so runners have the ability to train with it. Overall the volunteers were great and did an excellent job cheering on the runners. These are only two of the pictures I took of aid stations but they did offer several more on the route. Of course, the finish was right where the start was since it was a loop course. Here's what they had at the finish. Water, Gatorade(off brand - I tried it after and it was not bad), bananas, bagels, and granola bars. They also were giving out space blankets when you finished which is a nice touch given the weather can be a little chilly after the race. Race conditions were perfect in my opinion. Start in the 30's and finish in the 40's. For your registration, you received a race shirt(forthcoming and hopefully I can post a picture when I do receive it), course support including aid stations and police for traffic control and safety control. You also had a great place to sit inside before the race - a real bonus. In addition, there was the finish line food and the medal. 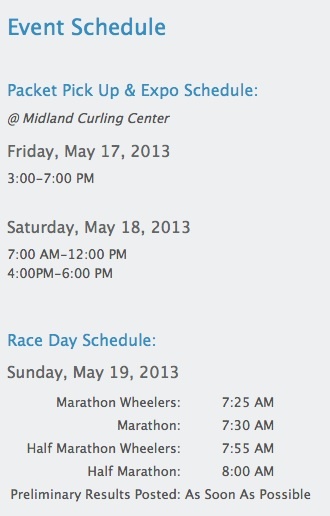 For those that could make it, there was a race expo the day before. Unfortunately, I could not attend so I cannot comment on the size or quality of the expo. The race course was also a certified course(soon to be due to the flooding issue changes) It would have been nice to see the QR Codes on race bibs so people could get instant results. 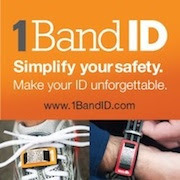 I also think that the ability to track your runner is a good option that was not offered - and should be at least for the marathon. Unfortunately, organization is such a huge part of a race and I just felt it could have been better. Keep in mind that I understand it's a huge undertaking to put on a marathon and the race did lots of things right. I know, given my vast race experience, that there were things that need to be improved on. The first and most important thing that needs help with this race is communication. The website needs to be reviewed much closer. All questions that need to be answered are not on there. 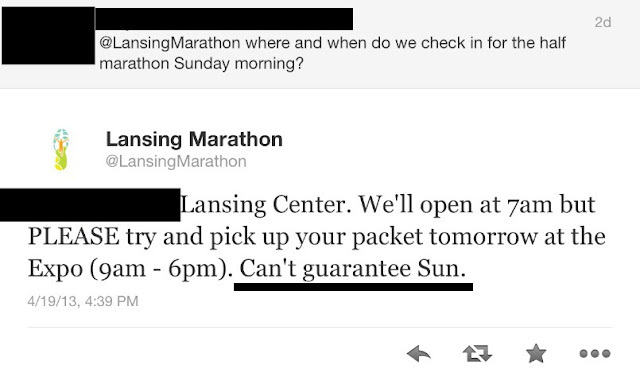 You can't tell runners the day before that packet pickup might not be guaranteed. Hey - maybe I'm making too big a deal of it(I'm sure I am) but I'm the customer and should be treated with respect whether I'm right or wrong. It's how it works in business and whether you believe it or not, racing is a business and runners have lots of choices for races. They did have a Facebook and Twitter account which helped but I'd suggest that the staff talk before posting things about the race so there is no confusion. It should also match everything on their website and all changes should be well know via email, website, Facebook and Twitter and not just one of these avenues. Also, some of the runners were stopped by a train on the course. While I understand that the race management has no way of controlling this, it would have been nice for them to tell the runners this might be a possibility and how they will handle the time lost if this occurred. Instead, they just let it happen and upset many people for no reason. Communication of this ahead of the race would have runners at least know what they were getting into so they did not have a surprise on the course. Shirts ran out and from what I heard from many runners, medals ran out as well for the half. There's really no reason either of these should ever run out. At least if they do run out of shirts, they should not be promised to the late registration runners as I said earlier. In regards to the medals, it's really hard to judge the medals with the additional demand to allow for only preregistered runners to get them. Unfortunately, the faster you are, the better chance of receiving one. The race said they will make everything right and all will get a race shirt and a race medal. As long as they follow through on this, that is good for me. I think they just need to find a better way so they don't run out next time. Overall, would I run the race again? Well, not until they fix the issues I discussed above(which is not that hard). 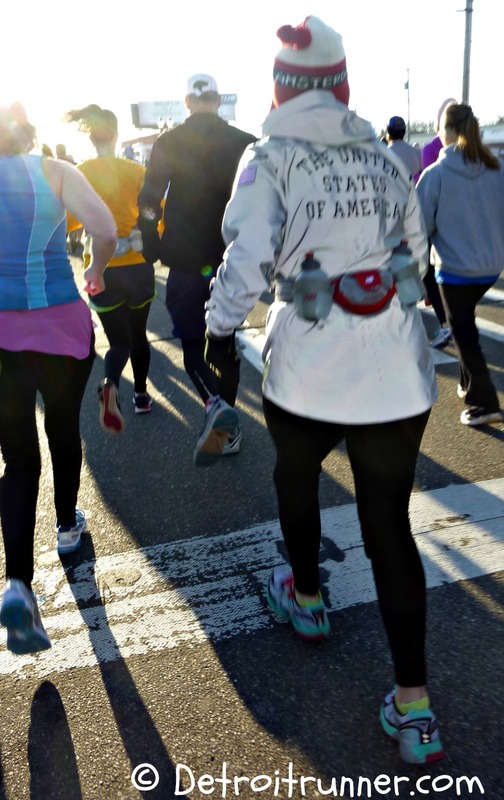 Perhaps, as one of my fellow runners suggested, a runner survey, would help the race management know what the issues are that upset people or suggestions for a better race. Not that I'm upset at all - my reviews are here for my readers to make informed decisions on what races to run. If it sounds like your kind of race, go for it! I loved the medal! In fact, it's one of my favorites of all the races I've done. A superior design! 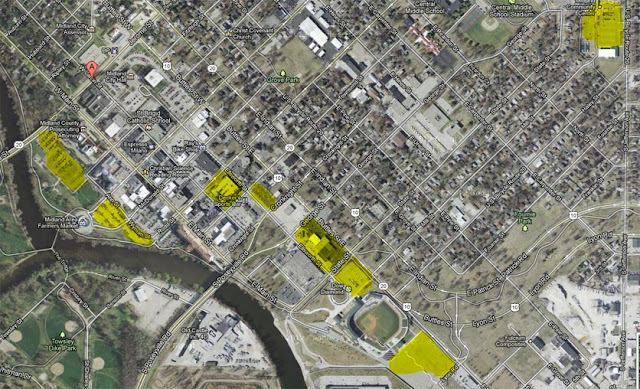 I also like the start/finish area, close parking, smallness of the race and a place to stay warm. In addition, we could use the real bathrooms in the Lansing Center while waiting for the race to start. Unfortunately, besides these things, there's not much to come back to unless they consider changing things to help improve the race. Regardless in all of this, what better way to spend a Sunday morning than running a half marathon! 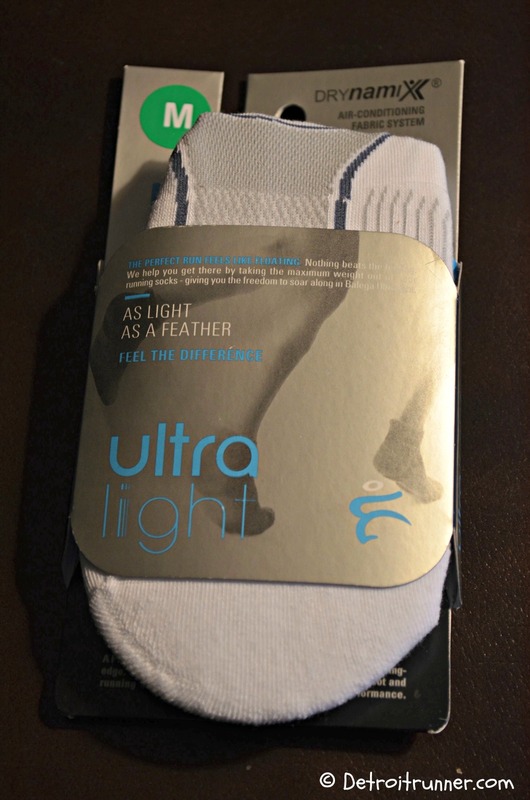 Balega Ultra Light socks review and giveaway!!! !